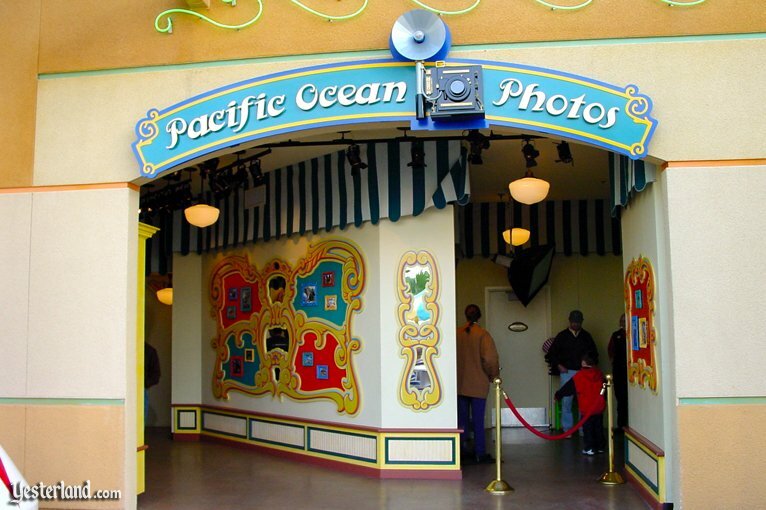 Welcome to Pacific Ocean Photos—the old-fashioned, high-tech novelty photo studio here on Paradise Pier. Would you like a photo of yourself and a friend climbing Grizzly Peak? How about Minnie Mouse helping you with sunscreen on the beach in front of Paradise Pier? Maybe a group shot with Grizzly Peak looming behind you? Or perhaps riding Grizzly River Run with Donald Duck, while your friend and the rest of the Fab Five watch from the shore? 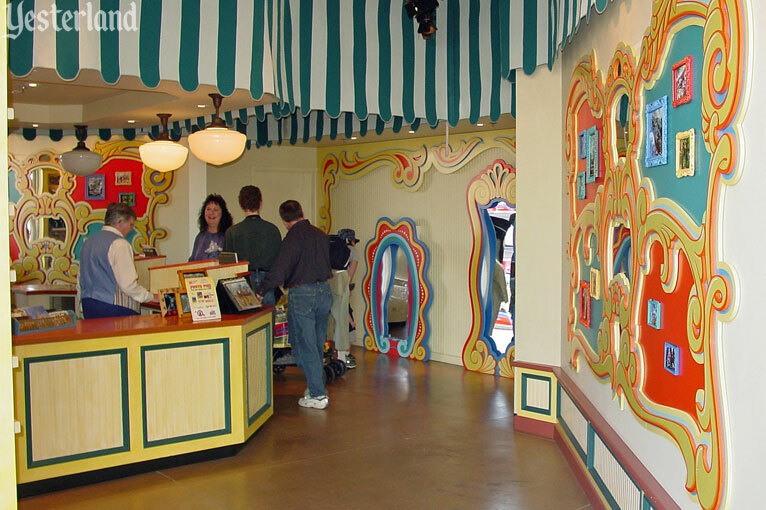 This novelty photo studio is located right between Strips, Dips ’n’ Chips and Malibu-Ritos, below the giant Mickey head loop of California Screamin’. 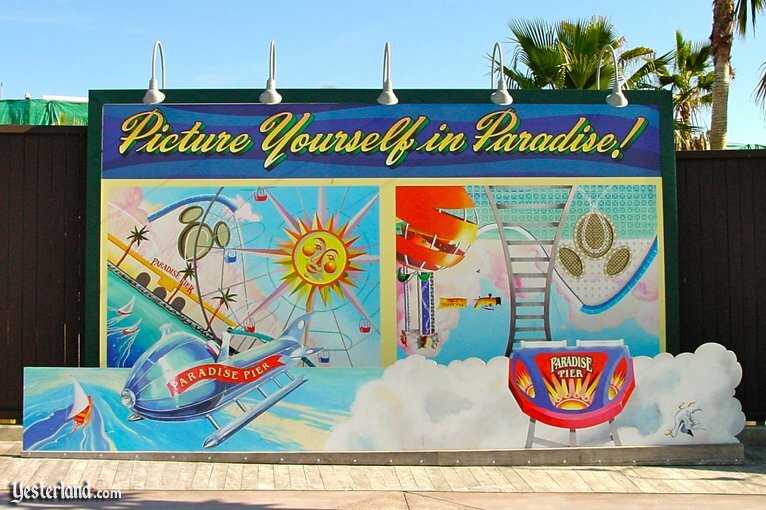 Look for the mural of Paradise Pier between the two entrances to Pacific Ocean Photos. 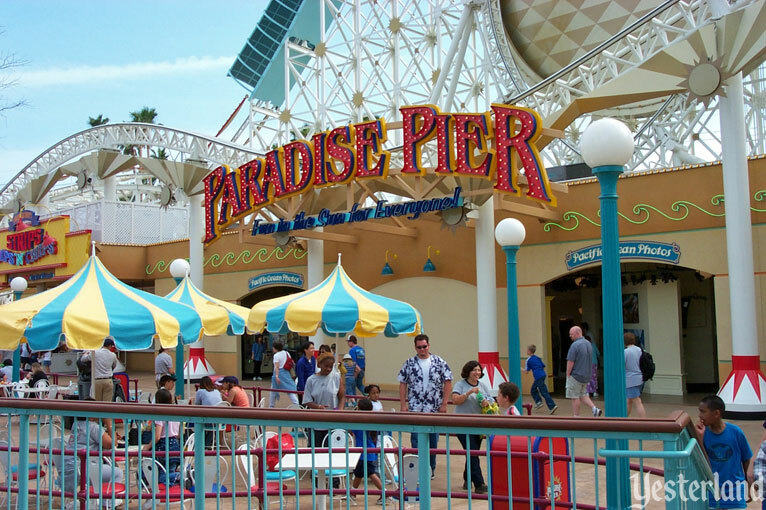 Paradise Pier is supposed to look like a charming early twentieth century amusement pier on the California coast—although the stucco building in front of you doesn’t quite exude such charm. It’s a film store too! Pacific Ocean Photos also sells Kodak film, Kodak disposable cameras, photo frames, photo albums, and camera batteries. Of course, if you have one of those new-fangled digital cameras (like the one Allen Huffman has), then you don’t need film. If you were expecting the inside of the studio to look like something from the days of George Eastman, you might be surprised by the simple, functional interior. Your backdrop is a chromakey green screen. Depending on which setting you chose, the photographer will position you properly against this backdrop before capturing your image. Using digital processing software, any part of the image that was green is transparent, allowing your image to be appear in the setting that you chose. Cool, eh? Just don’t wear a bright green shirt. If you do, then your torso will also be replaced by the background and your head will be floating somewhere above your pants. Don’t worry. Pacific Ocean Photos has costumes that you can put over your clothes. Actually, you may want to wear costumes in any case, just to make the photo more fun. 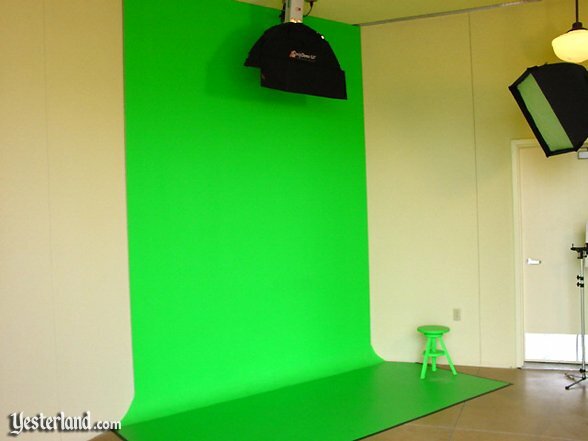 The reason that green is the preferred color for the chromakey process is that it’s so different from natural skin tones. No matter how queasy you feel after going on the roller coaster loop above the studio, your skin shouldn’t be so green that it causes a problem. But if somebody in your group is wearing bright green eye shadow, that might be another story. One 8"x10" print is $16.95; a second 8"x10" is $13.00. If you want something smaller (and a bit cheaper), one 5"x7" is $12.95; a second 5"x7" is $8.00. You can also have your photo put on postcards. Perhaps you’d prefer to take your own pictures rather that spending that kind of money. 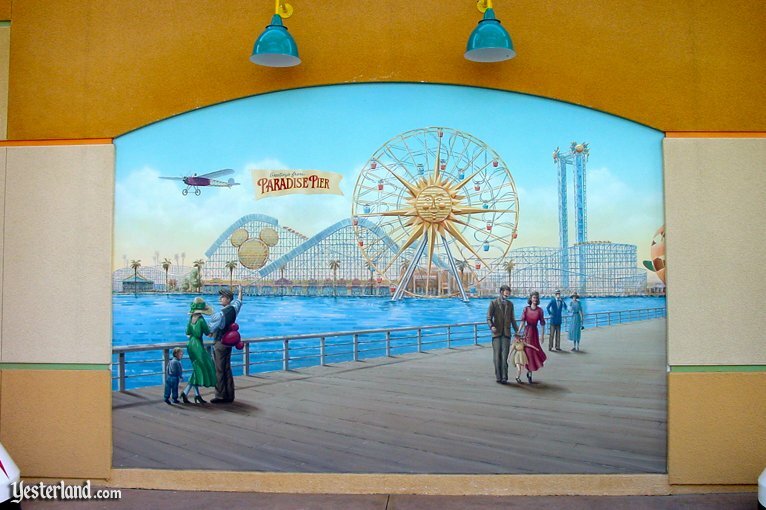 If you use your own camera, you don’t have to go without a clever California Adventure background. It’s a short walk from here to the “Picture Yourself in Paradise!” location. 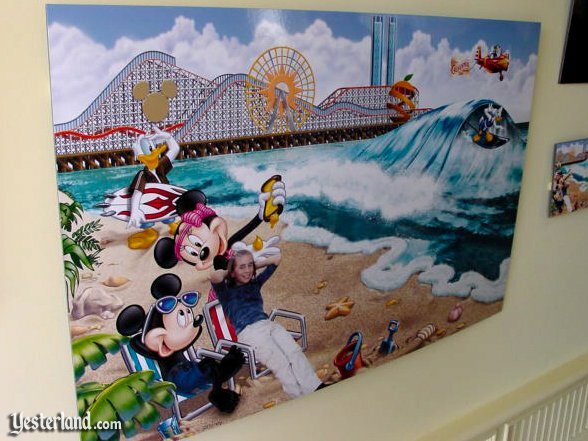 You have a choice of two settings for your own California Adventure photo. The one on the right is particularly fun. Have one or two people in your party get behind the nose of the California Screamin’ train. Frame your shot carefully. When you get your print, turn it upside down (or rotate it 180 degrees in iPhoto). Voilà! The subjects of your photo are at the top of the loop. 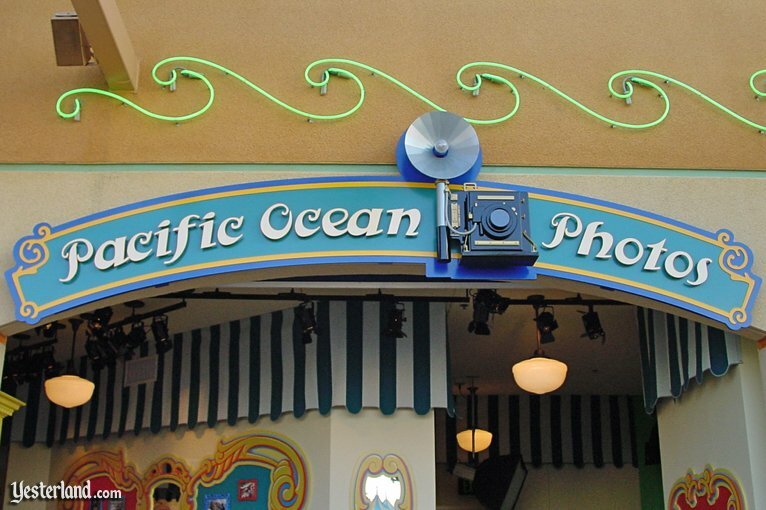 Pacific Ocean Photos was an opening day part of Disney’s California Adventure (now Disney California Adventure Park) when the park officially opened February 8, 2001. 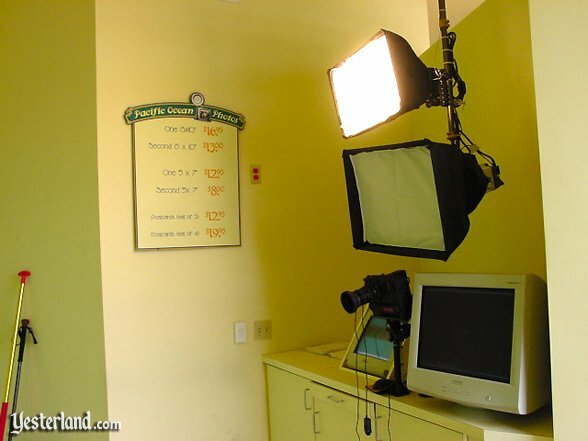 The photography studio and film store had two unassuming entrances in a simple stucco building that also housed two fast food restaurants. 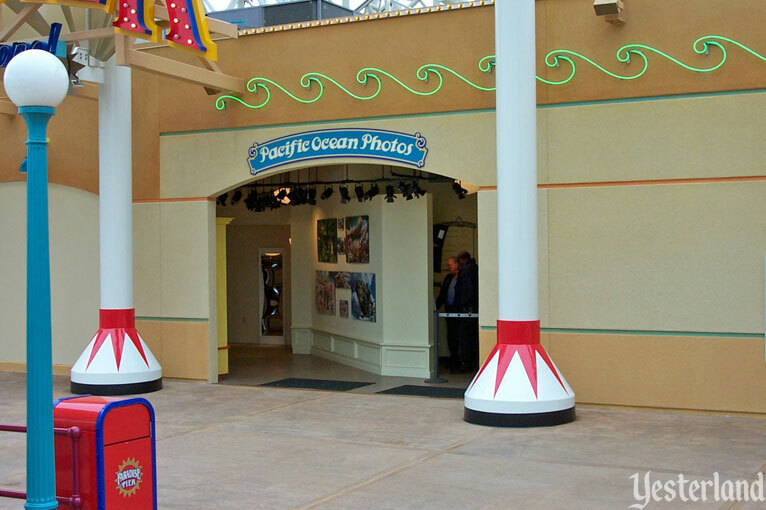 The name, Pacific Ocean Photos, was undoubtedly a play on Pacific Ocean Park in Santa Monica. 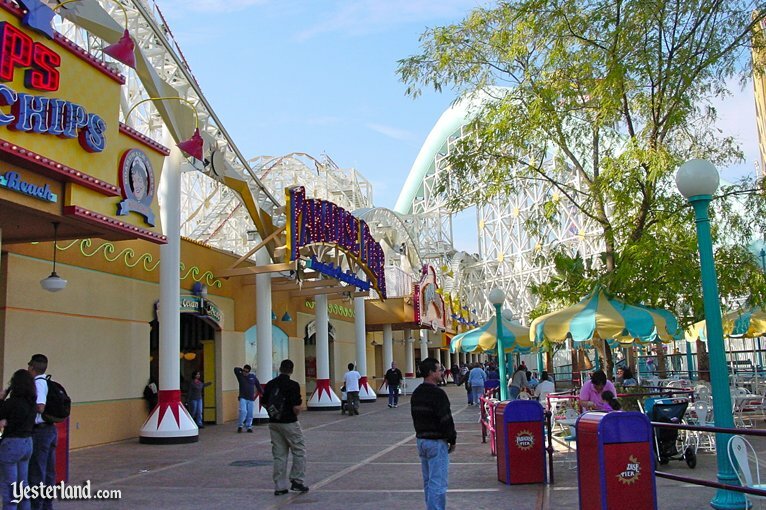 Built by a partnership of broadcaster CBS and racetrack operator Santa Anita Park, the ambitious amusement pier—called P.O.P. 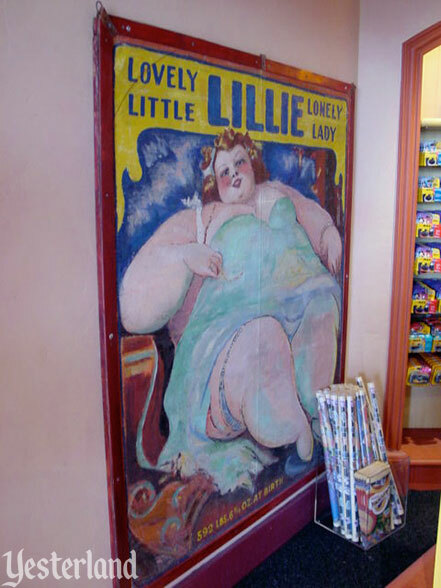 for short—was supposed to compete with Disneyland. It only lasted from 1958 through 1967. 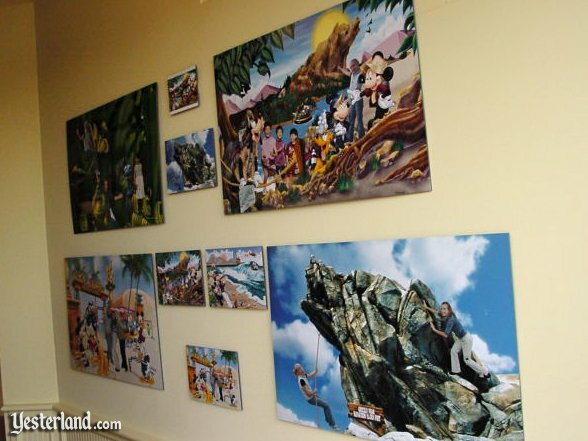 At first, there was not a mural between Pacific Ocean Photos’ two entrances. The signs above them lacked the old-fashioned cameras. By the end of 2001, the exterior had been embellished somewhat. 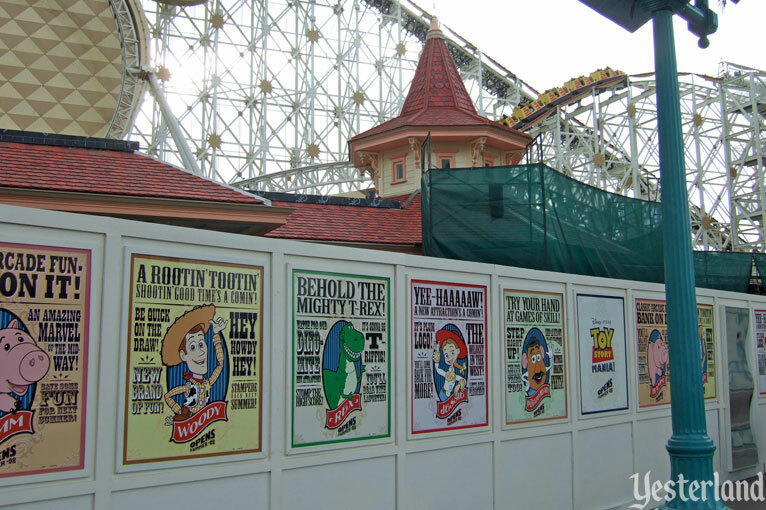 After more than five years or operation, Pacific Ocean Photos closed permanently to make way for the first major enhancement at Paradise Pier—Toy Story Midway Mania. In September 2006, workers erected a construction wall. By Thanksgiving 2006, the old building was gone. 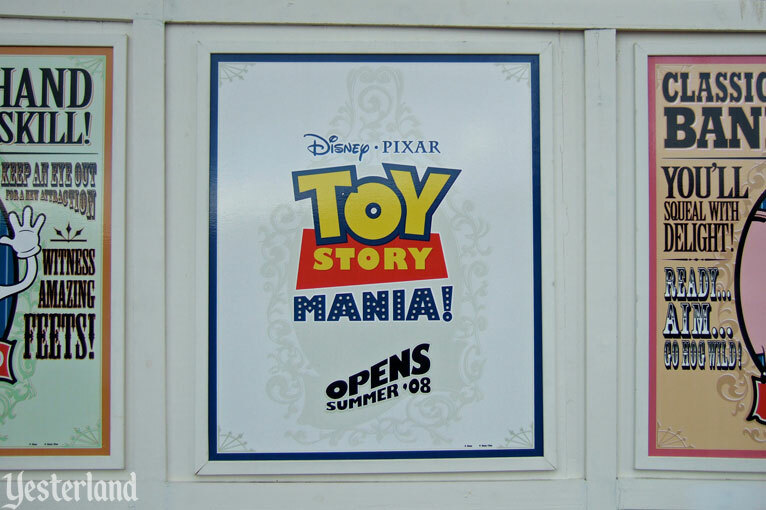 Toy Story Midway Mania opened June 17, 2008. A charming Victorian building had replaced a mostly flat stucco box building. 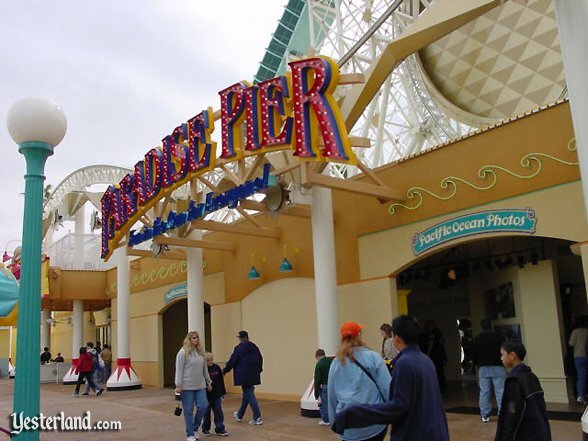 It seemed the rest of Paradise Pier would get a similar treatment in the coming years. But surprisingly little was done. 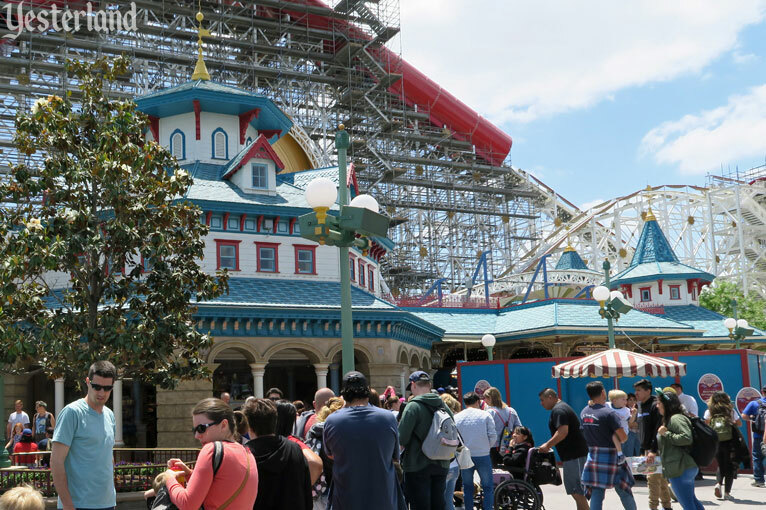 In December 2017, Disney announced that Paradise Pier at Disney California Adventure Park would be slit into two lands—Pixar Pier and Paradise Gardens Park—beginning Summer 2018. 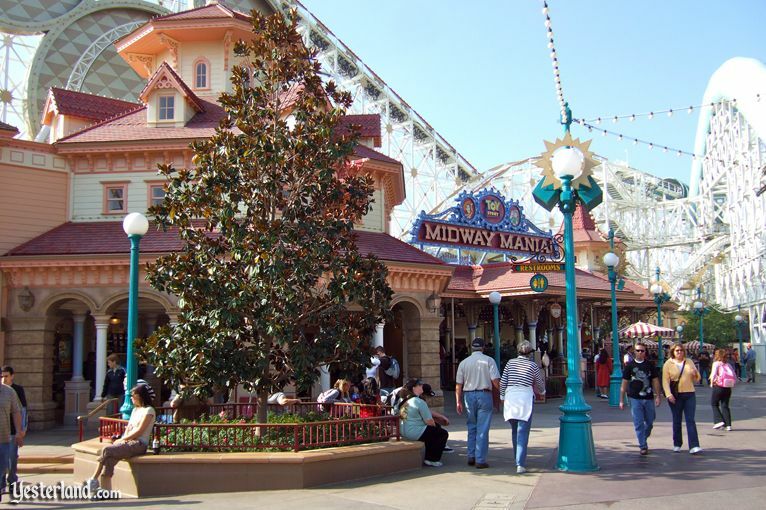 Pixar Pier would have four neighborhoods: Incredibles Park, Toy Story Boardwalk, Pixar Promenade, and Inside Out Headquarters. But what about fantasy photos? Just ask any Disney PhotoPass photographer. 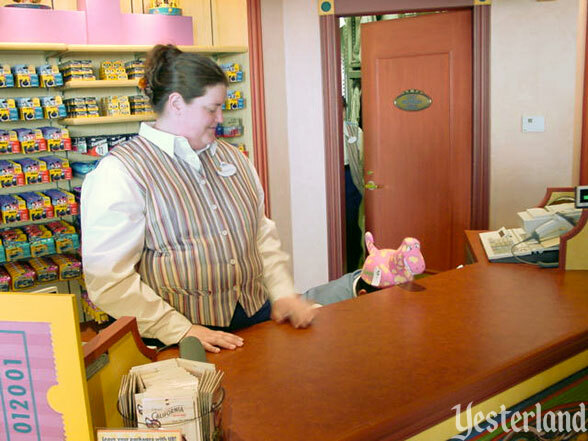 You can pose for some clever photos with digitally-added Disney characters.